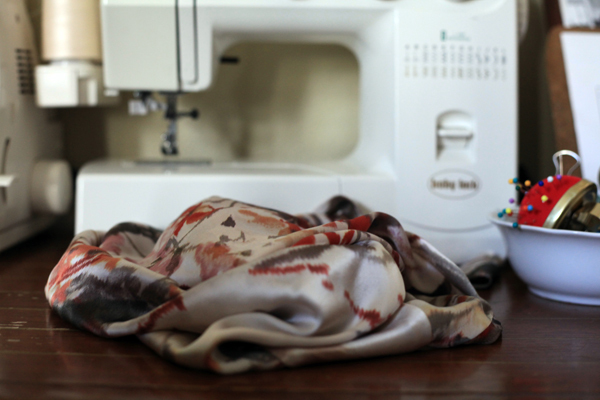 Recently, my sewing machine hasn’t been silent, but it also hasn’t exactly gotten a workout. A few weeks ago I was super motivated to sew something special for me. My first garment postpartum. I pulled out a favorite bit of silk (first used here) since I figured my love for the fabric would make sure my motivation stuck around regardless of the other demands on my time (read: baby girl). I spent all morning one morning carefully cutting out my garment pattern pieces from the silk. And, I literally mean all morning, hours and hours, even though there were relatively few pattern pieces. You might be thinking, “Wow, she’s really meticulous when she cuts silk.” But, in reality my cutting was only so-so. The reason for both the lengthy time and the so-so effort was baby girl. These days she can only stand to be by herself for a few minutes at a time. I can put her down for a nap, and she’ll be fine in her crib by herself for maybe five minutes. If she’s awake and I lay her on one of those mats with tons of dangly things overhead, she’ll happily play away… for fifteen minutes tops. The rest of the time she wants to be held close. She’ll nap just fine while being held. She’ll explore the world with great interest while being held. My solution has been to nearly constantly wear her on my chest in one of those snuggly things. In fact, she’s there right now. And, she won’t stand for laziness. No sitting allowed! My ironing board has become my work station since it’s tall enough for me to work at while standing. I can get by with a bit of laptop work since I can reach around her, though I have to admit I’m thankful I learned to type without needing to see the keys! Anyway, I always used to cut on the floor since I didn’t have a great table space for laying out fabric. But, working on the floor is almost impossible for me with a baby strapped to my chest. So, the silk got cut out in fits and spurts. Thankfully, my efforts were not all in vain. Constructing this garment did allow me to test out an iron I was sent by Hamilton Beach. First, a bit of backstory. Hamilton Beach reached out to me to ask if I was willing to try out their Durathon electronic iron with retractable cord. The iron I’d been using was ancient, it sprayed rusty water because I used to always forget to empty the reservoir after use, and it’s cord no longer retracted. I figured anything was better than it was, so I happily said yes! The Durathon electronic iron with retractable cord promises to be 10 times more durable than traditional nonstick irons and to have 25% more continuous steam power than the leading competitor. I can’t speak to either of these claims, but I can say that the iron performed just fine for me day after day as I snuck in time to sew. Unlike my old iron, which just had a temperature dial, the Durathon electronic iron has pre-set temperatures for different types of fabrics: synthetics, silk, wool, and cotton/linen. Each day I would plug in the iron and press the temperature settings button until silk lit up. Since each setting has a different colored light associated with it, I quickly learned to look for the yellow light at the start of each day. Once the light was done blinking, the iron was good to go. 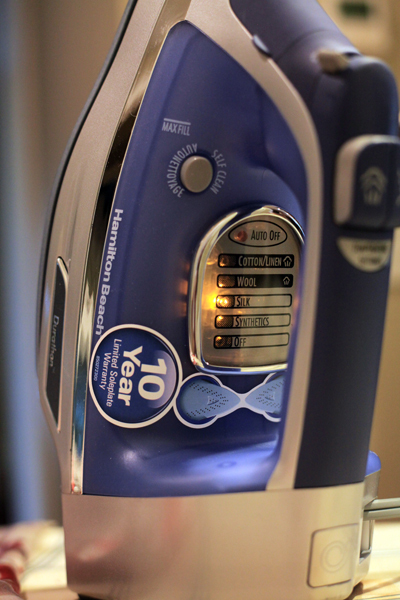 You’ll notice above that the iron is proud to display its ten year warranty. That round sticker you see above is even on the other side as well! I did a bit of digging in the manual and determined that the iron comes with a limited warranty of one year on defects in material and workmanship and ten years on soleplate wear. This sounds great in theory but since you are responsible for shipping costs both to send your iron back and to receive your replacement iron, at this price point it might not be worth the time and effort. Anyway, back to my test. Pressing went as well as I imagined it would. No magic was performed, but nicely pressed seams were had. One thing I noticed was that I couldn’t keep the iron horizontal and resting on its soleplate for too long before it would beep at me. When I looked in the manual, I realized that the iron has positional sensing and will turn itself off after 30 seconds if it is motionless while resting on its soleplate. What I was doing was leaving the iron in place to press the seam, then scooting it along the seam a bit, then leaving it in place again, and repeat. My little scoots were not enough to reset the position sensor. The manual notes that the iron needs to tilt more than 30 degrees to avoid triggering the auto shutoff. I learned to lift and tilt the iron in between areas of pressing so as to fend off the beeps. I guess that’s worth it so as to not burn my fabric!? As a note, the iron will also shut itself off if it is left resting on its side for 30 seconds and on its heel for 15 minutes. I interpreted “continuous steam power” to mean that this iron can create lots of steam without any real pause in steam production. I will say that I was able to get it to produce a pretty continuous stream of steam if I pumped the steam button. But, even on what I later realized was the low steam setting, I burned through the water reservoir pretty quickly. In the future I think I’ll keep a pitcher of water nearby so I can get lots of nice steam without having to keep making trips to the kitchen over and over. Now for my favorite part – the giveaway. As much as I enjoy testing products, the biggest reason I do it is because I enjoy sharing the wealth. 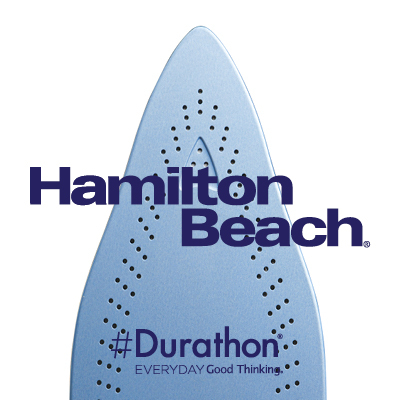 In this case Hamilton Beach has offered to give away a Durathon Iron to one of you! If you’d like to be entered into the drawing, just leave a comment below letting me know. I’ll pick a winner at random next Thursday, March 20th at 7 am PDT. Good luck! Previous Post Sew Expo Recap: Classes and Fabric and People, Oh My! I also have a terrible old iron which means I barely ever wear the lovely things I own that need pressing, and always end up with shiny seams, so this would be a vast improvement! I would like to enter the contest. Best wishes as you learn to sew v in the world of baby girl! It is amazing and wonderful that you are even attempting to sew with Miss Baby Girl vying for your attention. Good for you! I’d love to take a chance on winning the iron. Amy, before you know it, Baby Girl will be sewing WITH you. Please add me to your iron giveaway list. Hope I get picked, I could use a good iron. I would love to be entered in the give away for the iron! Amy, these days will go by much too quickly — enjoy the time that BG is able to fit in the snuggly! The days are long, but the weeks are short, they say, and it’s true! Please add me to your list for the giveaway. Thanks! Did I spy a self clean button on the iron?! So cool! 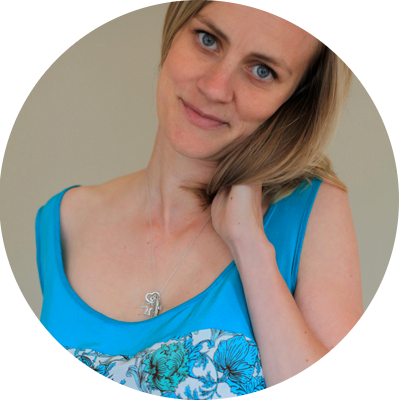 Oooh…I’d love a chance to win, thank you! Hope to see your new project soon. I am very impressed at you even attempting to sew with a tiny baby to look after! Even though I am quite jealous of you getting to snuggle an infant all day.. sigh. I would love a new iron, so please sign me up for the giveaway! I would love an iron that turned itself off! I am always getting yelled at for leaving my iron on too long. Oops! I love that you were dedicated to making the garment all while on constant mommy duty. Baby girl loves her mother and loves having your attention, how sweet. I would love to be entered into your giveaway, thank you. My current (super cheap) iron also has auto-shut-off and at first it drove me crazy, but now that I’ve gotten in the habit of just checking to make sure it is on before I sew a seam that needs pressing, I actually really like the feature. I’d love to have a NICE iron that won’t burn my house down! I REALLY need a new iron! Thank you for the review. Even if I don’t win this one, I will add you comments to my search for a new iron. Thanks again! I dropped my iron multiple times (darn cord) so I really, really need a new one. Thanks for sharing your thoughts on this model and hosting this giveaway! I’d love to be entered into this – my iron only steams when it’s feeling motivated (which may or may not match with my expectations). Thanks! I’m guilty of leaving the water in my iron too. It’s always leaking rusty water when it turns on! Oh yes! My nice iron finally broke last year, so I’m using a cheap horrid replacement. It doesn’t even have a burst of steam setting! The horror. Thanks for hosting such a fabulous giveaway and providing a full review! I’d love to win this iron! I still have my mother’s ancient iron that I remember seeing around when I was a child. It still works, but it might be nice to upgrade. I am so impressed that you tried to make a silk(!) garment while taking care of a newborn. I’ve been meaning to try and squeeze in little 15-20 min sewing sessions during weekdays, and reading this is a good reminder that you make time for the things you love. Also, I’d love to win this iron – mine’s a cheapie, and this seems like a nice upgrade! Thank you for the opportunity to win this iron. Our church group sews quilts for our wounded soldiers and our iron frequently gives us trouble. It would be nice to have a reliable iron. Aww, well I guess they’re only little for so long! Soon you’ll be missing her cuddles. Glad you are finding a way to make it work even with a new little one. I’d love to try a new iron. The retractable cord sounds great too! Haha I have never had an iron that “steams”, let alone the rest of the stuff this one does. I have only had old second hand ones that that went hot, that’s all! Oh your baby’s need to be held brings back memories, both of mine were like that and they never had naps longer than half an hour, everything took so long to do! Enjoy this time together. Nice iron too! I’d like to be entered! I seem to go through irons with sewing. An iron!!!! Oooo- I would LOVE a new iron! Mine has been dropped so many times I am surprised it even works anymore! I feel your pain about making a garment with beloved fabric and then having it just not work out. Hope you find a way to fix it, the fabric is beautiful! 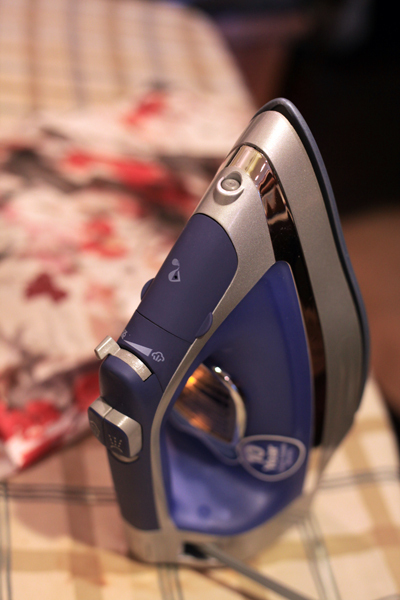 As for this iron giveaway….it couldn’t have been more perfect timing as I just burned some synthetic fabric onto the plate of my current iron! Whoops! Wow, thanks! A really nice giveaway! I’d love a nice, new iron! The one I have is about 20 years old and smells a bit like burning and the plug sparks on occasion, haha! I can never seem to justify buying myself a nicer one, what with so many other things that need to be covered with our house, pets, etc. Thanks for hosting the giveaway! Would love to be entered. My one must with an iron is an auto-shut off. Don’t trust myself. Thanks for the review. I’d love a chance to win the iron. I had a baby girl like that, all I hear in this post is your pain! get people to help. Get the to take her for a walk and grab 30,injures sleep, hold her while you have a cup of tea, hang out the washing etc. I would love a fancy-schmancy iron like this! I would like a chance to win this iron. Thanks! I just replaced my old iron, but I’m not thrilled with the new one! I’d love to replace my replacement! Thanks for the great giveaway! I would LOVE an iron that doesn’t leave brown pools on my ironing board covers! I would love to be entered! 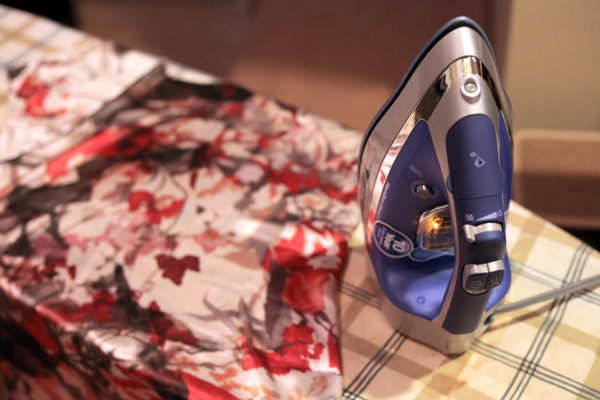 a retractable cord on an iron is a dream! My iron sprays rust water, too! (Clearly I wouldn’t mind winning one that does not). The joys of motherhood! Perhaps you should sew more practical items that can stand baby throw-up and can be washed for the time being. I hope you can salvage that garment because that print is beautiful! Thanks for the iron review. I have been looking for one forever! Glad you are able to do some sewing around (literally) your baby girl. I’d love a new iron. I am currently shopping for a new iron. I really like the T-Fal ultra glide, had one a while ago that died. I”ve not researched this one, but it looks great! I would love to be entered into the giveaway! I have a love/hate relationship with my iron…its settings are either too cold or too hot!! Gahh! I would love to have this iron. Using the one I have seems dangerous…. Wow! You are ambitious! I spent the week moving my sewing room and deciding the best spot for my old GE irons I inherited from my grandmother. They make great book ends! Regarding the French seams, Louis Cutting has an even quicker method: use your threaded serger to make the first seam (the wrong sides together one) using the narrow 3-thread setting. This adds some body and allows a perfectly cut edge that gets wrapped in the seam when you see the second (the right sides together) seam. I tried this with a sheer white silk and it looks great. I was concerned the serger thread would show through the sheer, but it doesn’t, and this method works particularly well for shoulder seams where the fabric could use a little more stability. Enjoy the weekend Amy! I’m impressed you find time to sew with a new baby! I would love a chance to win a new iron. A good iron helps so much! Great, in-depth iron review! Can’t believe you’re already into silk sewing post-baby. Way to go! Wow I am so impressed with your sewing dedication! I had so many plans to sew with baby boy in the sling but I haven’t done much at all yet! I’d love to win this iron thanks for the giveaway. Hey! My youngest daughter did not like being put down to sleep at first either. So I would carry her around in a snugly thing until she was fast asleep & then lay her down. That usually did the trick. Also, have you tried swaddling? 😉 Just some thoughts to help with your sewing. 😉 cheers. I would love a new iron as I pack mine to and from sewing classes that I give to our local 4H kids and it has seen better days. It will get easier to sew with a little one around, hang in there! i’d love to win the iron, but if I’m not so lucky, I think I will check this out at the store. Oh, I remember those days well. It gets better. i still don’t have the hours to sew like I used to but baby girl does take pretty decent naps these days. And she’s pretty content to sit in the pack and play and play with her toys while I sew for a little while. I always end up stopping to play with her, though! I’d love to win a new iron! My 20 year old rewenta has sure taken a beating! I didn’t know retractable cords were a thing, but they sound great! I could also use an iron with better steam. Thanks for the review. All the accoutrements are great, but the retractable cord is the tipping point for me. You have no idea how annoying a dangling cord can be, amirite? Wow I really would like to enter here and try to win the give away the iron looks really and so does your blog!! i would love to win an iron! we dont own one! As baby girl grows, get a basket of sewing room only toys for her. Gave me more time at the machine!!! Good luck. and thanks for a chance at the iron. I have been in the need of a new iron. 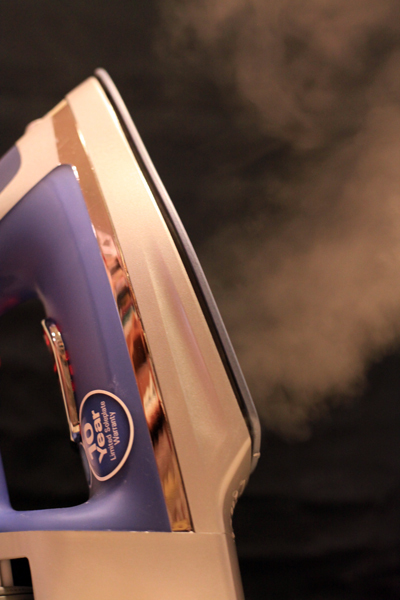 My iron is now over 35 years old and while it has been great the steaming action now spits out and no matter how many times I try to clean the system out it continues to leave huge water spots on my garments. I was promised one for my birthday (hmm.. yeah.. back in November) but still nothing. I love the retractable cord idea. I would love to win that iron…but even more so talk about babies! My first was the same as your baby girl, I couldn’t put him down for more than a few minutes at a time. The only real nap he would take would be during our daily walk, and it didn’t matter if I walked for 15 minutes or two hours, he would wake up as soon as I walked up our driveway! It was crazy! Around 10 weeks he started to mellow out ( I loved those last two weeks of maternity leave!) and he was fine and dandy and napping well for daycare. Enjoy that little snuggler! I sewed the same way as you, with each of my babies strapped to my chest. The fun really begins when the ex-babies (I.e. toddlers) offer their help! Enjoy them when they’re young, it all passes too quickly. Thanks for running this give away, I would love to be entered. Thank you for sharing the wealth with such a practical giveaway. I appreciate the chance to enter your contest. I’d love to be in the drawing for the iron to test! Thanks!